Inky Fairy Designs: Girl Land with Webster's Pages & Unity Stamp Co.!! Girl Land with Webster's Pages & Unity Stamp Co.!! I am SO excited to be sharing in the fun this week in Girl Land!!! This whole week, Unity Stamp Co. is partnering up with Webster's Pages for TONS of inspiration and even a giveaway or two I hear! Have you seen WP new Girl Land line? Omgosh, *swoon*, I just ADORE it and Unity has released the PERFECT background stamps to go with this entire line. I created a scrapbook page using both the awesome new background stamps and the gorgeous papers. Webster's Pages has a collection kit that includes Girl Land papers AND embellishments! Yep, the fabulous trim and bling you've come to adore is in the kit. I used this collection and a few of the new itty bitty background stamps by Unity Stamp Co. & Webster's Pages co brand. I LOVE them and they are so versatile, perfect for cards, scrapbook pages, altered projects & I'm definitely using them in my art journaling pages as well! Well, I don't want to keep you, to see my FULL project reveal & enter to win the fabulous giveaway be sure to go to the Unity Stamp Co. Blog and also check out Webster's Pages blog for more fun and chances to win!!! We'll be playing all week and winners will be announced on Saturday! ILove the butterfly! Great inspiration, really pretty page. loooooooooooove Webster’s Pages! Amazing Project!! So far, so good. The butterfly DP is gorgeous....can't wait to see more! 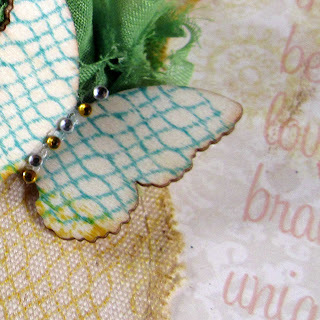 swooning over that butterfly and the textures I see.